You are going to love today's recipe. Can you believe Thanksgiving is in only 15 days??? I know, and tomorrow is Christmas. Ha - that's what it feels like - time is just flying bye. Have you planned out your meal yet? If you need a good roll recipe, these Cloud Like Crescents were easy, buttery and delicious and this Sweet Potato Casserole is irresistible. Thanksgiving is not Thanksgiving without some kind of Banana Cream Pie. It is my all-time favorite pie EVER. Even though it is really easy to make, I usually only get to enjoy it once a year, BUT I see myself making these bars all year long. My family loved each and every layer of these luscious bars. Nilla Wafers, Cream Cheese, Bananas, Pudding, Cool Whip and Caramel are all combined into one delicious dessert. If you want to try something a little different this year, try serving these bars instead of pie. Combine wafer crumbs and melted butter and toss until crumbs are coated in butter. Press crumbs into the bottom of a 9x13-inch baking pan. Refrigerate until ready to use. Refrigerating the crust hardens it and helps it stick together. Beat cream cheese and sugar in a medium bowl until smooth. Fold in 1½ cups of whipped topping. Spread evenly over chilled crust. Top with sliced bananas. Next, beat pudding mixes and milk for two minutes until slightly thickened. Spread over bananas. Top with remaining whipped topping and carefully spread out evenly. Refrigerate for 3 hours before slicing. Drizzle with caramel topping before serving. Note: For easy removal, line baking pan with parchment paper before pressing in the crust, with a slight overhang, so you can lift the bars out of the pan for cutting and serving. Oh my gosh! Are you kidding me?! 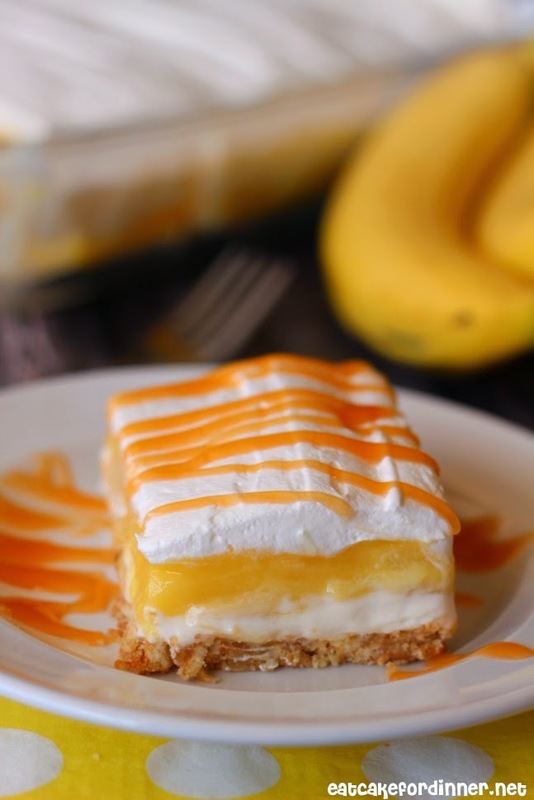 I love banana cream pie and I really love the fact that it is in bar form. Pinning!! This recipe is so perfect. 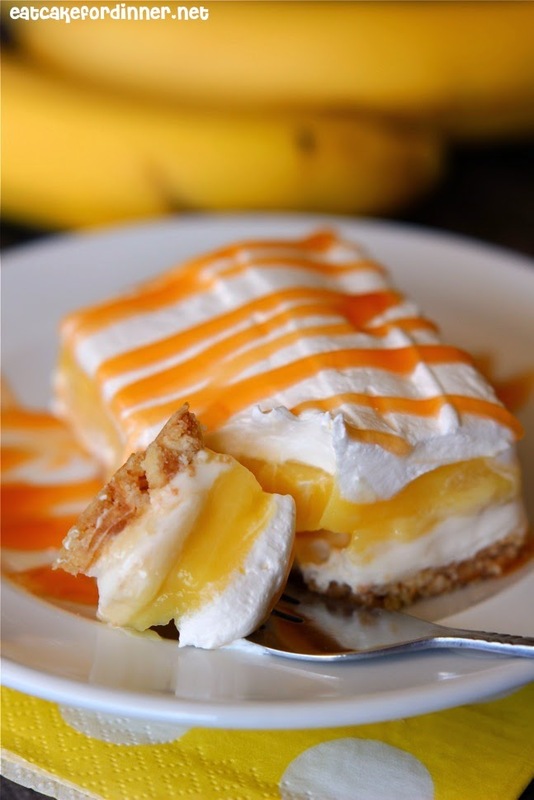 I think I prefer banana cream pie in bar form now after seeing this recipe! I fell in love with these bars just looking at the pictures!